Three sites launched this week to promote two new products: 2010 Ford Fusion and 2010 Lincoln MKZ. 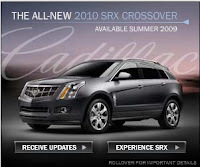 A third site launched, previewing the new 2010 Cadillac SRX to be released in summer 2009. The Ford and Lincoln sites are sites I was a part of and worked on quiet extensively. Please share your thoughts about the sites as I'll just let them speak for themselves. I will add that both sites are a digital extension of both campaigns and are designed for awareness purposes. The Cadillac SRX site is a debut that is aimed directly at the Lexus RX350. 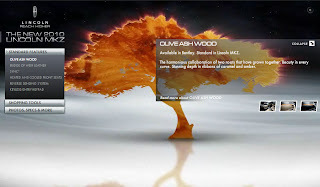 The site is pretty straightforward, as it is just introducing the product. No positioning and the online media I caught on AutoBlog.com has a Call to Action to Receive Updates. I did, still no update or thank you after a day. Wow, this is a great blog. My e-Commerce manager sent me this link. I love that you are on twitter, too. I'll have to look you up; I'm MyAtlantaFord. This should be interesting! Thanks for finding the site useful. I'll add you right now on Twitter.